Hollywood has landed in Toronto. It has been reported that actor Mark Wahlberg has uncorked one-of-a-kind luxury by purchasing an exclusive, 4,600-square-foot penthouse at 36Hazelton, which comes with a $12 million price tag. But there’s plenty of selection to tempt other buyers, with suites starting at 1,073 square feet and priced from $1.6 million. With a total of 18 suites incorporated into the historic facade of the former St. Basil’s Separate School, buyers can own a unique part of the seven-storey terraced building. Quality and custom detail is seen in the suites, which went on sale on May 16. No construction date is confirmed but occupancy is set for late fall 2013. Maintenance fees at 80 cents a square foot are comparable to other buildings in the area and hydro is individually metered. Two-storey configurations are found in four suites from around 1,300 square feet to more than 2,100 square feet. Also being offered is a distinctive townhome unit with a private courtyard. 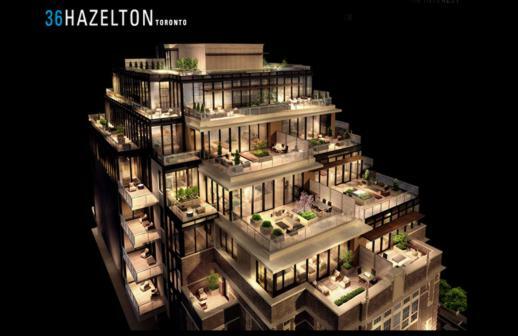 The townhome will be built into the facade of the heritage building (constructed in 1928) and will offer 13-foot ceilings in the living room and a semi-private elevator. Each of the units — with open-concept layouts, 10-foot ceilings and custom finishes — has a balcony or terrace. The outdoor spaces range from roughly 160 square feet to about 1,300 square feet, while the penthouse has 2,881 square feet of outdoor space on two levels.